Everyone deserves a beautiful smile. 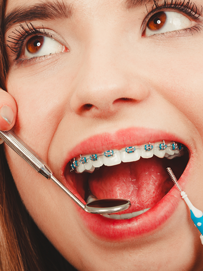 For many people, wearing braces is the first step towards achieving that smile. In fact, in the U.S. today, an estimated 4.5 million people wear braces according to the American Association of Orthodontics. And while nearly 75% of kids and teens will wear braces, adults are also using braces to correct crooked or shifting teeth. Even celebrities are wearing braces. Actresses Kate Hudson, Gwyneth Paltrow and Emma Watson all wore braces for orthodontic reasons while Beyonce Knowles donned braces to support her fans who were self-conscious about their own braces! With so many people wearing braces, it is essential to know the proper care and brushing technique to get the best results from the time you spend in braces. Today’s braces are lighter, stronger, and more comfortable than the braces of the past and come in several types: metal, ceramic and invisible braces. Your orthodontist will help you choose the best type for your needs. Once the braces are on, they will be with you awhile and plaque and food particles have more places to hide and accumulate so maintaining proper care is a must. As a general guideline, brush after each meal and aim for two minutes. Follow the basic steps below to ensure that your mouth stays fresh and clean. First things first… Choose the right toothbrush. A toothbrush with softer bristles is safer, prevents gum irritation and is less likely to bend a wire or break a bracket. Remember to change your brush every three months. Next, before you start brushing, rinse. Giving your mouth a quick rinse with water will help to remove some of the loose food particles that accumulate around the brackets. Once you are ready to start brushing, hold your toothbrush at a 45-degree angle and start brushing at the gumline placing the toothbrush on the top of the brackets and angling down. Then reposition the toothbrush to the bottom of the brackets and wire and angle the toothbrush up. Move slowly and gently until all teeth are clean. And remember to floss! Though flossing can be a challenge with braces, a floss threader can make the process easier. If you can’t brush right after eating, be sure to rinse your mouth with water until you can brush. Finally, be sure to maintain your checkups and talk with your orthodontist about any questions that come up while you are on your journey to a healthy and brilliant smile. Chat with us today for your free consultation.